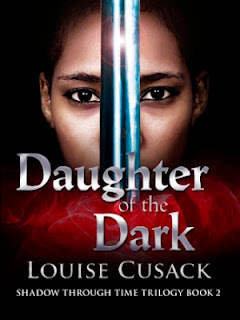 DAUGHTER OF THE DARK is the second book from author Louise Cusack in the SHADOW THROUGH TIME trilogy. Princess Khatrene was married to the Dark and gave birth to his child. But as expected it is not a son but a daughter. The evil nature of the Dark forced Khatrene to run away from him and he is after his wife to torture her more and his child. She is saved from the Dark's clutches by her Champion, Tallis. Tallis is in love with her and will do anything for her safety. To save the child, Talli's cousin, Pagan, another guardian takes the child to Magoria- our earth. Coming out of a lake with a child in his arms he meets Sarah, who takes them in though she knows they are alien beings. The child is named Glimmer. Glimmer growns up with extra ordinary powers. For she is the child of The Light and The Dark and she is destined to join the four worlds of water, air, fire and earth together. This is a superb example of a fantasy world created by the author Louise Cusack. Her story telling is spell binding. She will keep you hooked from the very first page of the first book DESTINY OF THE LIGHT from this trilogy. This is a gripping tale about a fantasy land and has a very honorable hero in Pagan. Sarah is another strong heroine whom I absolutely adored!